Apple released a recording of yesterday’s iPad 2 special event. 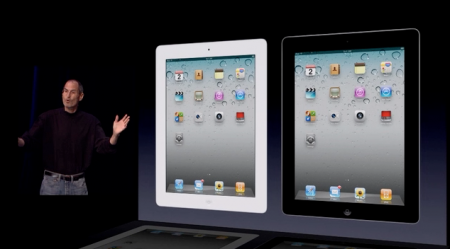 Apple’s CEO Steve Jobs announced the second generation iPad which will be released March 11th. iPad 2 is powered by a dual core A5 processor, %33 thinner and %15 lighter than the first generation iPad, available in black and white, same prices as the iPad 1 and 2 cameras with FaceTime support. The iPad 2 will begin selling in the United States March 11th and will be released in the following countries March 25th: Australia, Austria, Belgium, Canada, Czech Republic, Denmark, Finland, France, Germany, Greece, Hungary, Iceland, Ireland, Italy, Japan, Luxembourg, Mexico, Netherlands, New Zealand, Norway, Poland, Portugal, Spain, Sweden, Switzerland and the UK. I estimate that we will get the iPad 2 officially by May but FaceTime will be disabled. During this event Apple also demonstrated GarageBand and iMovie for the iPad as well as previewing iOS 4.3 update for the iPhone, iPad and iPod touch. You can watch a stream on Apple’s website or download it as a podcast on iTunes or watch it on YouTube.